Harshvardhan Kapoor doesn’t play the title role in Bhavesh Joshi. Anyone could. This is a film about pricking awake the conscience, so well written, and so successful in downplaying the image of the typical hero. Anyone could be that prick. On the other hand no one really bothers. Why should they when all you get for trying to change the status quo is a death in the gutter? What makes this film an important testament on the need to make your voice of protest is the language used to convey that urgent need to raise one’s voice. 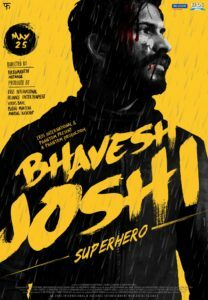 Though wrongly marketed as a super-hero film Bhavesh Joshi actually tells us why the cult of super-heroism needs to be urgently replaced by a more practical and tenable form of working class heroism. Hence Sikandar (Harshvardhan Kapoor) is at first happy being a pseudo-reformist spewing reformatory jargon in smoky pubs until something happens to put him on red alert. The film has a slow steady and solid buildup to a climactic outburst that is so powerfully shot it leaves us with a sense foreboding for the hero whose mask peels off to reveal the face of the ordinary man suffering the indignities of a system that allows politicians to fleece and flee. Nishikant Kamat makes a menacing villain. A politician on the corporator’s level who dreams of controlling Mumbai. What makes Aditya Motwane’s film on the extraordinary heroism of ordinary people is its relentless statement on unostentatious heroism. Harshvardhan Kapoor, in a post-debut role that allows him to prove he has the creative chops to carry a role even when cast as reluctant hero, steps into the heroic mould without losing his sense of ordinariness. The young actor excels in conveying the helplessness and growing rage of the average youngsters who watches the dance of plunder, this time it is Mumbai’s water supply that plundering politicians desire. How we look at Sikandar (Kapoor)’s efforts to stop the plunder is entirely reliant on how effectively we accept Harshvardhan Kapoor as an actor who excels in being in a man who won’t give up Anna Hazare’s dream of re-structuring story. Harshavardhan gets ample opportunity to play a character who gets caught in definitions of heroism. He is well supported by two other young actors Pryanshu Painyuli and Ashish Verma who play Harshvardhan’s brothers in arms. Bhavesh Joshi is a film that catches us off guard. Its message of social awakening spotlights a film that is brave and bleak. Shot with striking sense of the raw and the real by cinematographer Sidharth Duwan this is a film that salutes a wounded civilization without resorting to the flag-waving patriotism of Parmanu. It doesn’t offer instant solutions and home-made remedies against corruption in politics. It tells us all to go out there and try to make a difference. Just like the producers and director of this film have done.